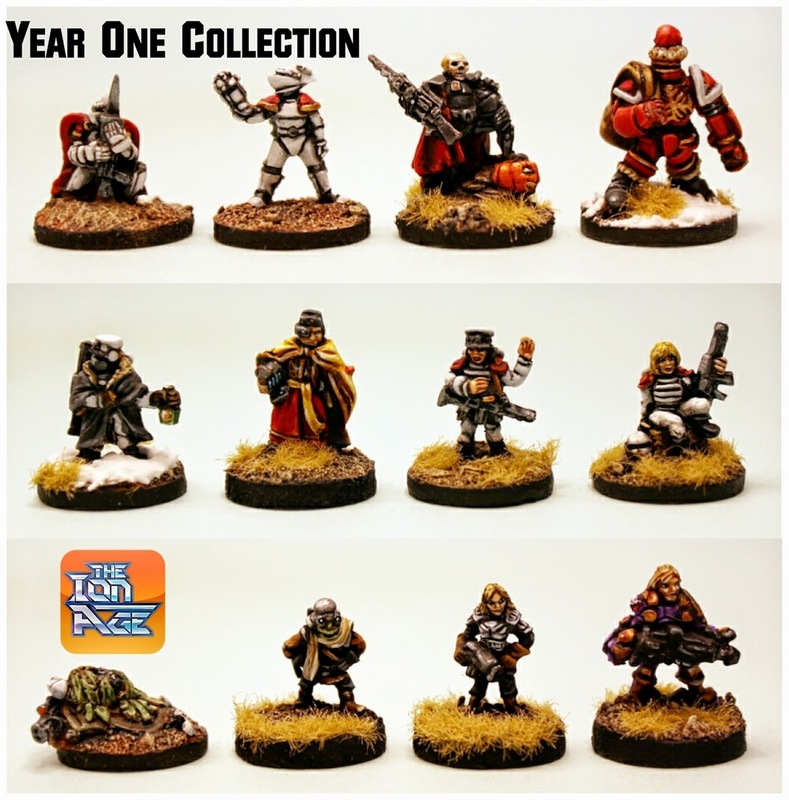 The Ion Age Blog: Ion Age Year One Collection now online! August will mark the one year birthday of The Ion Age and as I hinted at a week ago we are going to be having a month of new releases, special offers and sneak peeks too. This will go across the whole month but it starts here and now in terms of releases with the Year OneCollection. We at The Ion Age love to give things away free. We love to keep the fun in wargaming and to make our universe deep and rich and one way we do it is the monthly free miniature. Every month we have a special IMP series figure which is put into all orders for free. This release gives you the option to purchase formerly free miniatures from Year One. That is August 2013 to August 2014. The prices are reasonable and it means you can get the ones you might have missed and get more of any you like the look of for your collection. As I have said people asked for this and since we now have ten fold more customers than we did when we started out it makes a lot of sense. But not to worry...Year Two kicks off in four weeks with another free and unique miniature. Month One (Aug - Sept 2013) - Kneeling Retained Knight in Cloak. Month Two (October 2013) - Retained Knight with Power Fist. Month Three (November 2013) - The Knight of the Dead with Pumpkin. Month Four (December 2013) - Santa Desteria with sack of Presents. Month Five (January 2014) - Winter Musterman with Bottle. Month Six (February 2014) - Zin Envoy. Month Seven (March 2014) - Female Muster Patrol Officer. Month Eight (April 2014) - Salute 2014 Promo, sitting Muster Girl. Month Nine (May 2014) - Retained Sniper prone camo net. Month Ten (June 2014) - Malig Tank Ace (space goblin). Month Eleven (July 2014) - Female Adventurer with Pistol. Month Twelve (August 2014) - Starvaulter Instructor in powered armour with laser rifle. This code comprises twelve different 15mm miniatures in white metal. These were formally the free in all orders monthly miniatures from August 2013 to August 2014. You have the option of purchasing a whole collection or three whole collections with a saving of 10%. You can also select single miniatures from the drop down list. These run from top left (Month One) across by row to bottom right (Month 12). Go HERE. Lastly yes this does mean that you can now get IMP12 before it becomes the free miniature but I am cool with that. We will be changing the free miniature on the 31st July for the month (and outlining what is coming on the 3rd of August too). This is being done for my benefit as I will be travelling on the 1st of August. But any orders that come in from this point until August will get IMP11 Female Adventurer AND IMP12 Starvaulter Instructor free automatically with bought codes. Excellent! Wow, I will be adding this to the list plus all the other items. The old grey matter may explode from all of the thinking.